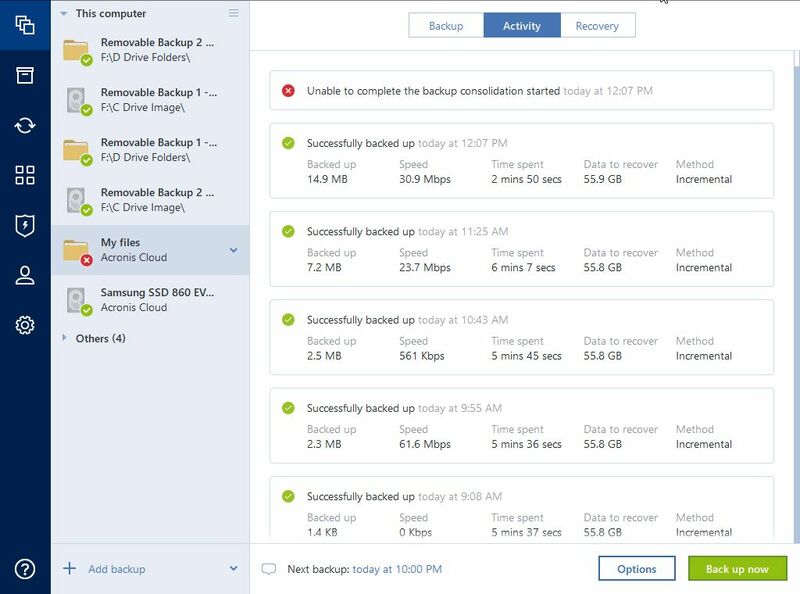 Using Acronis True Image 2019 and backing up one computer's selected files to the cloud. Data size is 54GB, and I have plenty of spare space on the cloud. Last successful cleanup was Friday 15th March. I have been getting this error recently. Backups just seem to never complete the cleanup phase, and two hours later I get an email saying the backup failed (though Acronis says the backup succeeded and only the consolidation failed). I'm currently trying to do clean-ups on that dataset from the Acronis cloud webpages, but it is not clear if anything is happening. Hang on, it says it finished. I guess I'll wait and see what the next backup status returns. Hmm. The failure email I just received says that backup size is 296GB. I guess that might be all the stuff that hasn't been cleaned-up/consolidated? Andrew, I'd open a support ticket. I had a cleanup issue recently as well as someone else in a thread recently. I'll look for it and link it here. I think there is a cleanup problem inin certain situations, but Acronis is going to need to look at these to figure out why. Not sure if yours is related, but yeah, it could be growing if not cleaning up and failing to backup and or cleanup due to something similar. Will open up a ticket. It does look like the same problem. I had considered the same "solution" (deleting the dataset and starting again), but would prefer to avoid having to do that if possible. Yeah, I get it. My data set was so small it was fine, but I'd really like to know what the issue is and why it's happening. Especially since it seems to be happening a bit more frequently than it probably should be. I just finished my large 600GB push of a new backup and it took 16 days. If this one ever gets messed up (again, happened long ago with this data too), I'm not going to be happy.